The Kintone Mobile UI is scheduled to update May 2019. 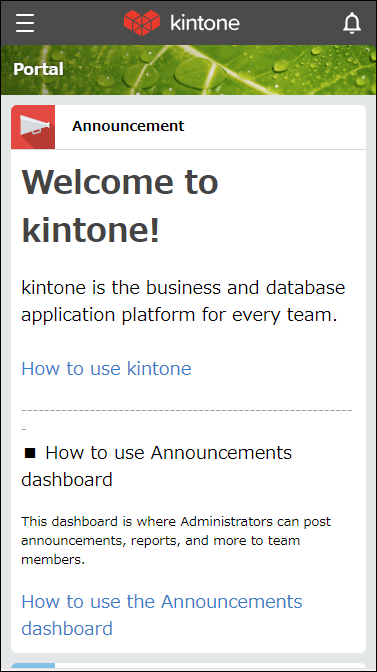 Kintone users will have access to a preview version starting Sunday, March 10, 2019. 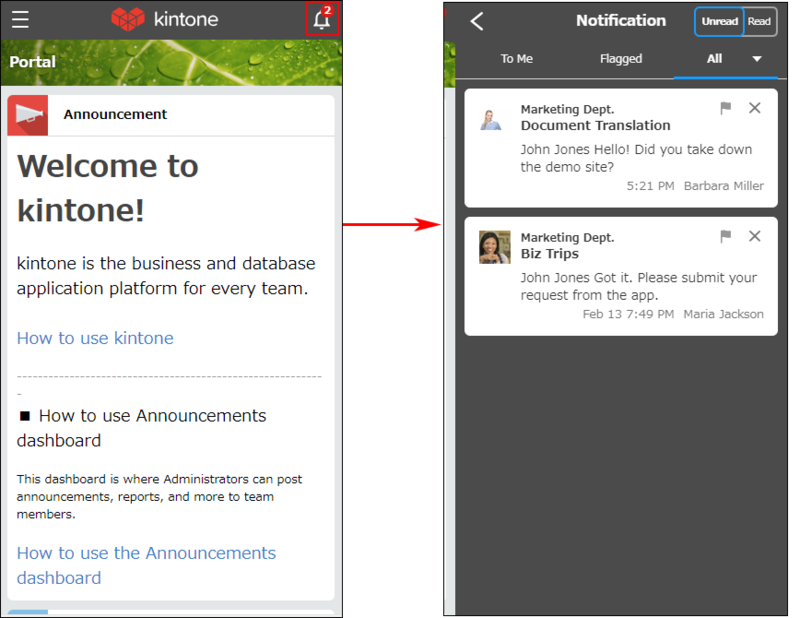 To try the in-development mobile UI, check Enable new mobile UI (preview version) in Feature Activation under Kintone Administration. Please note, only Kintone system administrators can enable the new mobile UI. iOS/Android apps are not available for preview. 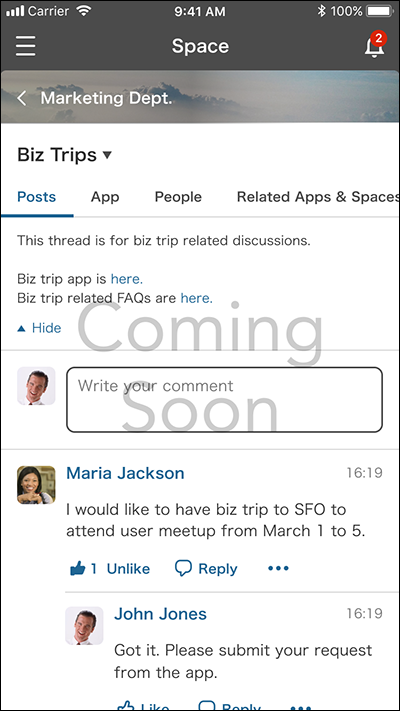 Use a web browser on your mobile devices to try the in-development mobile UI. Screens and features introduced here are currently under development. The preview version will be updated at any time, and screens and features may be changed in the official release. The release date of iOS/Android "Kintone mobile" apps is scheduled for the end of May 2019. 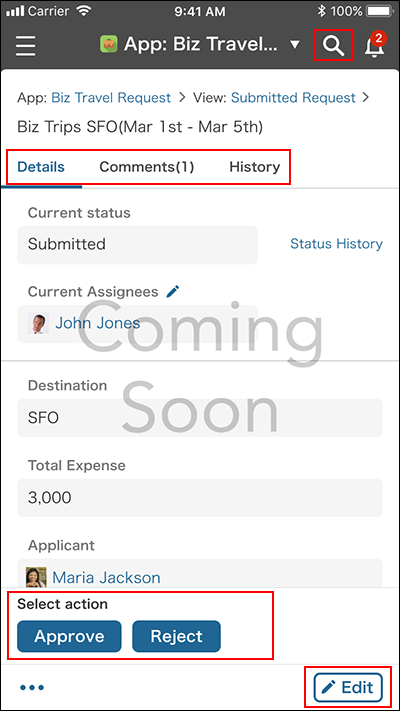 By updating Kintone mobile after the release date, the new UI will be displayed. When you first access the mobile UI, the portal is displayed similar to the Desktop View. Under the announcement area, the list of apps are displayed. If you tap the menu at the upper left side of the screen, the navigation menu will open. You can easily access the following items from the navigation menu. In the list of apps, you can tap the pin icon to add/remove apps to/from your favorites. In any screen, you can tap the menu to open the navigation menu. If you tap Assigned to Me in the navigation menu, records that need to be processed are displayed with the number of assigned records. 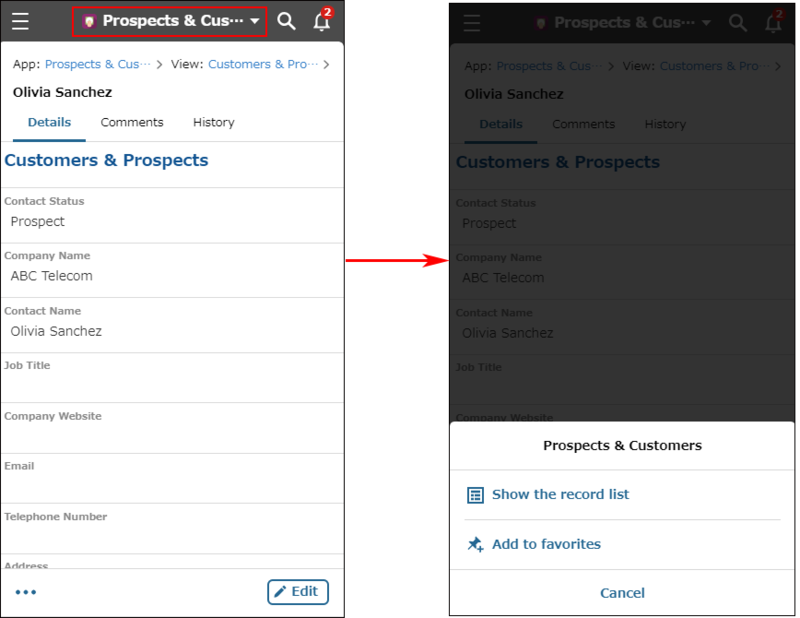 By using tabs, you can quickly switch record displays, such as details and comments. 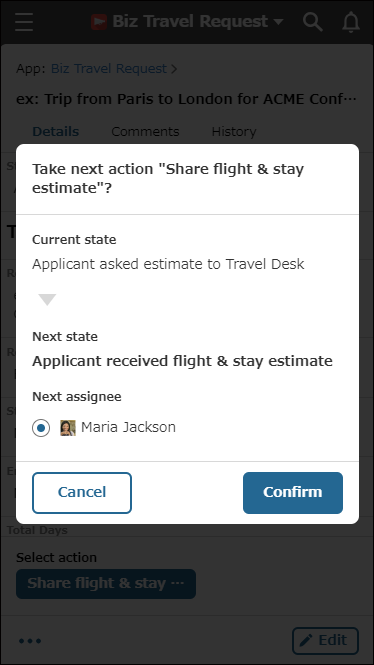 This new UI allows you to easily confirm record details and contact submitters before you select the necessary action. If you tap the button to proceed, a confirmation screen will be displayed. You can confirm the flow after taking the action. Like the Desktop View, you can search all of Kintone. Search results include full-text search results as well as apps and spaces. The Search result screen on the right of the screenshot below displays the new design after the update on April 14, 2019. 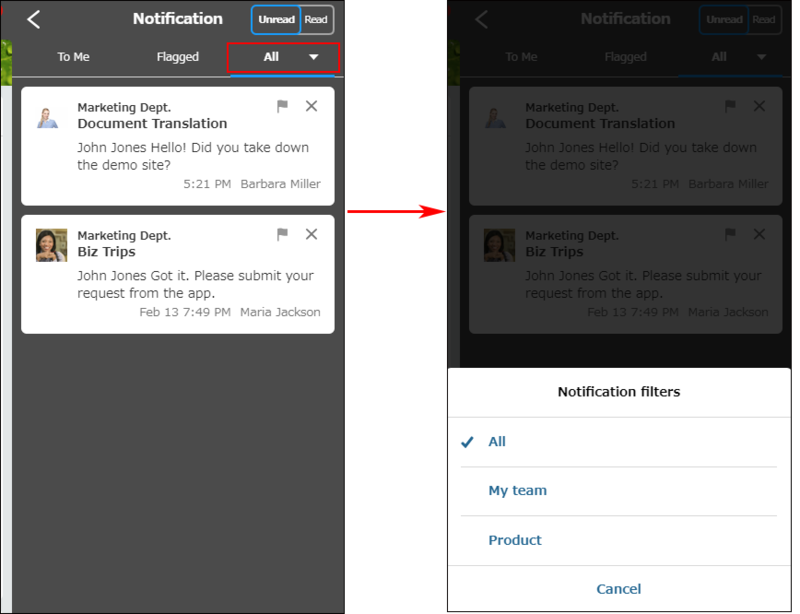 The notification menu displays at the top right of each screen, so you can confirm your notifications at any desired time. The number of unread notifications is displayed in the notification menu. You can confirm notifications while you are working in another screen, and go back to the original screen by tapping back . This feature is useful because you can check notifications without suspending your work. In the notification screen, you can toggle between Read and Unread, and also filter notifications by using To Me, Flagged, and All (or notification filters you created). 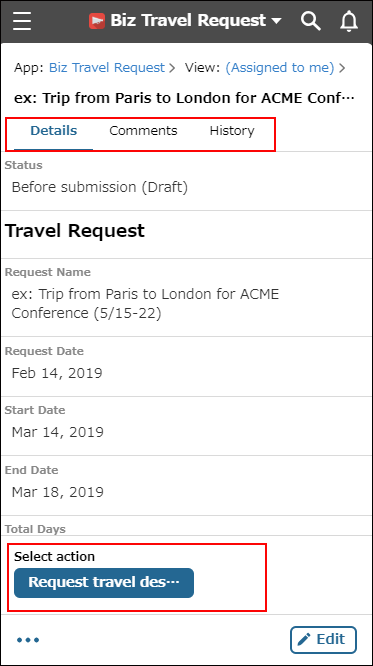 After the update on April 14, 2019, the notification list is refreshed by pulling the screen down and releasing (pull to refresh). After the update on April 14, 2019, the record view is displayed using the table format, similar to the Desktop View. 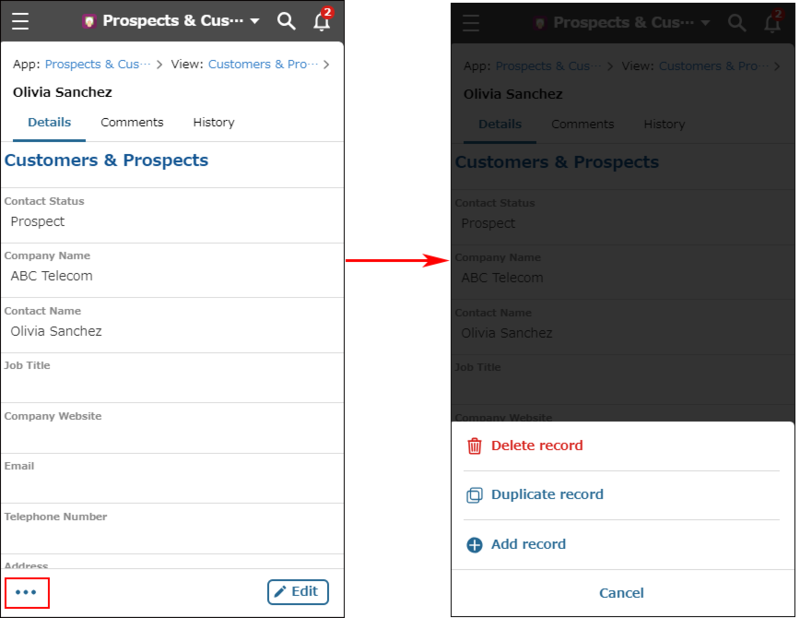 Attachment fields cannot be displayed in the record view following the April update. You can tap tabs to display details, comments, and history. In the April update, you can write your comments while you are editing records and confirm the record details while you are writing comments, like in the Desktop View. Edit button and action buttons for process flow are displayed in the fixed position, so that you can press them whenever you like. App contents can be searched by tapping search . Breadcrumbs (hierarchical list of links) are displayed in record details screen, and you can easily go to other pages such as the top page of the app. For the official release, we will further improve the design of record details screen. Below is the screen under development. The action menu for the app is displayed by tapping the app name. From the action menu, you can move to the top page of the app ("Show the record list"), or you can add/remove the app to/from your favorites. From the menu at the bottom left side of the screen, you can add, duplicate, and delete the record. In the official release, we plan to provide the same operability of spaces as in the Desktop View. Follow the steps below to enable new mobile UI. Only Kintone system administrators can configure this setting. Access Kintone from a desktop computer. 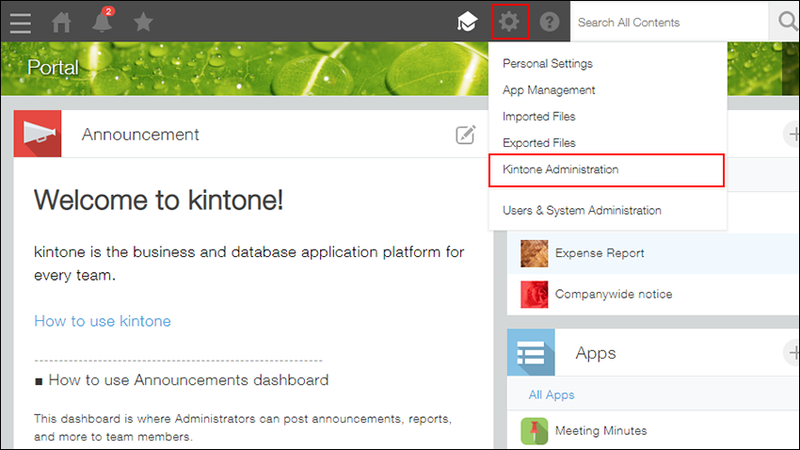 Click the gear wheel at the upper right of the screen and select Kintone Administration. Check Enable new mobile UI (preview version) under Feature in Development. If you enable this setting, the preview version will be applied to mobile screens for all users. Mobile screens of the currently released official version will become unavailable. Screens accessed from iOS/Android apps remain the same as the current official version. To try new mobile UI, use a web browser on your mobile device. Follow the steps below to change Desktop view to Mobile-optimized view. Access Kintone from web browsers on your mobile devices. Click the settings menu at the upper right and tap Mobile-optimized view. This menu is not displayed if Mobile-optimized view is already enabled. 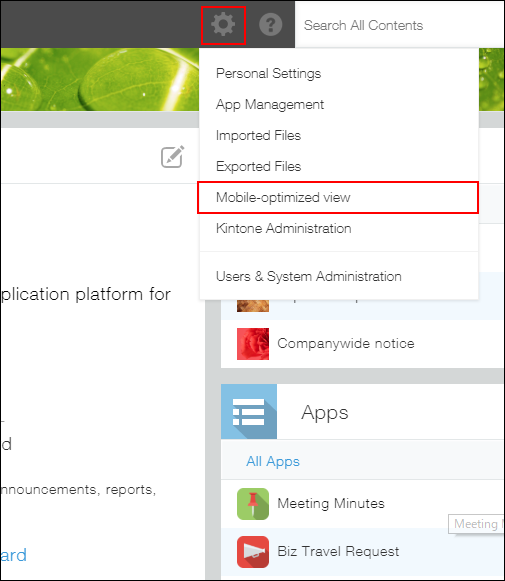 If Allow users to switch between mobile-optimized view and desktop view under Default View for Mobile Browsers is not checked in Kintone Administration, Mobile-optimized view menu will not display. For more details, see Default View for Mobile Browsers. New mobile UI is displayed. To return to desktop view, open the settings menu and tap Desktop View.